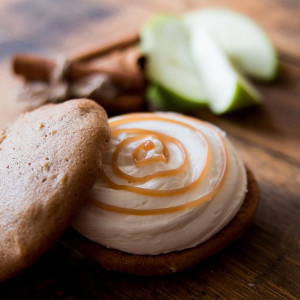 Why The Whoo(pie) Wagon Will Make You Say "Whoopie!" Article and photos, unless otherwise noted, by Eric Hurwitz. Article created on 3/19/2019. 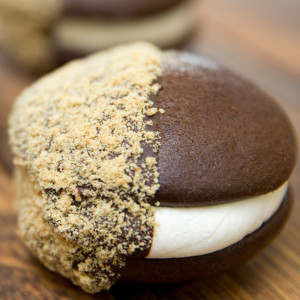 S'Mores whoopie pie from The Whoo(pie Wagon. Photo credit: The Whoo(pie) Wagon. Many consider Maine and Pennsylvania the sweet spots for whoopie pies, but lovers of this mouthwatering snack should definitely add Topsfield, Mass. to the list. The Whoo(pie) Wagon, at the Topsfield Bakeshop in quaint downtown Topsfield, has gained a well-deserved reputation for creating some of the best homemade whoopie pies anywhere. 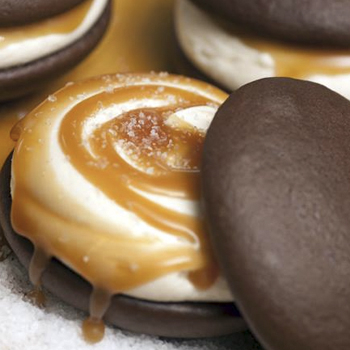 Maine and Pennsylvania certainly receive a lot of press for the whoopie pie and, often, deservedly so. 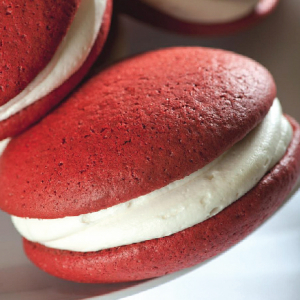 The best whoopie pies from those two states can be absolutely delicious. 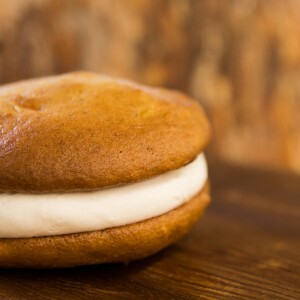 The Maine State Legislature even deemed the whoopie pie as the official state treat of Maine. 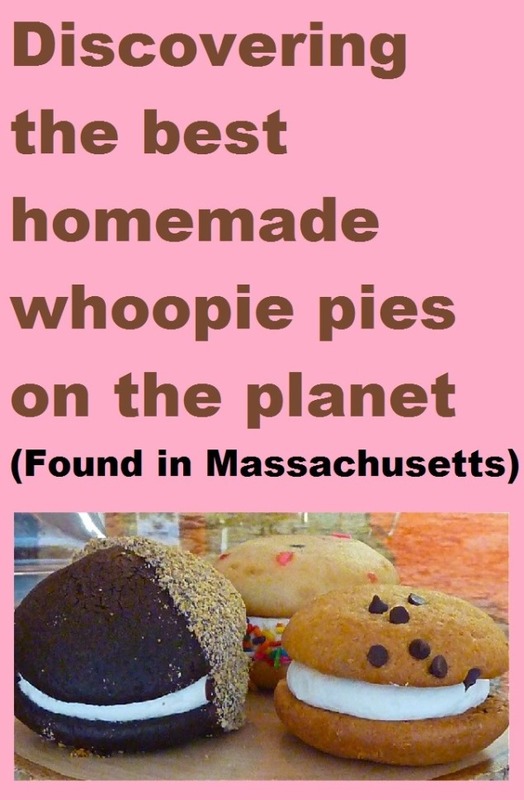 This makes sense as Labadie’s Bakery in Lewiston, Maine, became the first seller of whoopie pies in 1925. The Amish in Pennsylvania made the treat famous generations ago. 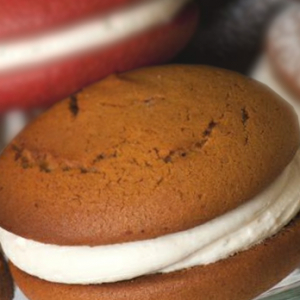 Amish legend has it that children would shout “Whoopie!” when finding whoopie pies in their lunch bags. It's easy to understand why: If made correctly, it's hard to top this snack made from two soft cookies (typically chocolate) with a creamy filling sandwiched in between. This writer has tried many Maine whoopie pies and a few Amish kinds, but would, by far, prefer The Whoo(pie) Wagon version. 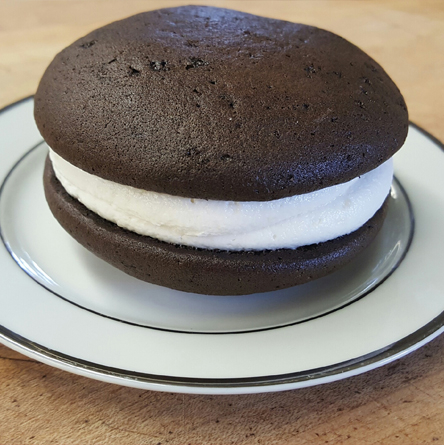 It might sound strange that the best homemade whoopie pies come from a region of Massachusetts known for its fried clams, but owners Mary and Chris Bandereck have taken their vast culinary experience to create the perfect whoopie pie. The pies combine enough firmness to hold the soft texture together, while the filling bursts with flavors not overwhelming or masked by being too sweet. The balance is perfect and exquisite -- a true form of culinary artistry. 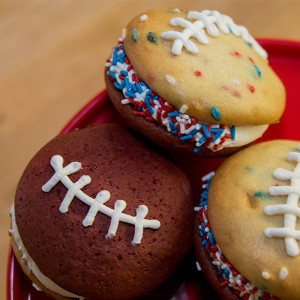 Additionally, the whoopie pies remain agreeable in the digestive tract 20 minutes later -- a time when typically, the aftermath of Crisco Oil and other additives contribute to that regretful aftertaste. Chris and Mary, on the other hand, focus on making their whoopie pies with all natural ingredients. They feel no need to cheapen the products by extending the shelf life through preservatives. 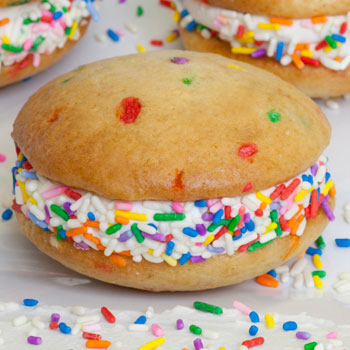 Unfortunately, some of the most highly visible whoopie pie companies have gone this route. Mary and Chris have steadfastly stuck to their core mission. "We focus on baking fresh daily," said Mary. 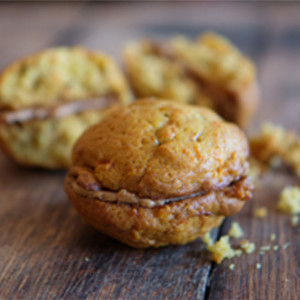 "While we have grown as a business, we feel it is best to keep things the old-fashioned way and don't want our whoopie pies to be sitting on the shelf. We use all fresh, natural ingredients and create in small batches." Chris, Mary and crew at The Topsfield Bake Shop have increasingly worked harder to maintain making the whoopie pies in small batches, but it has been a challenge. 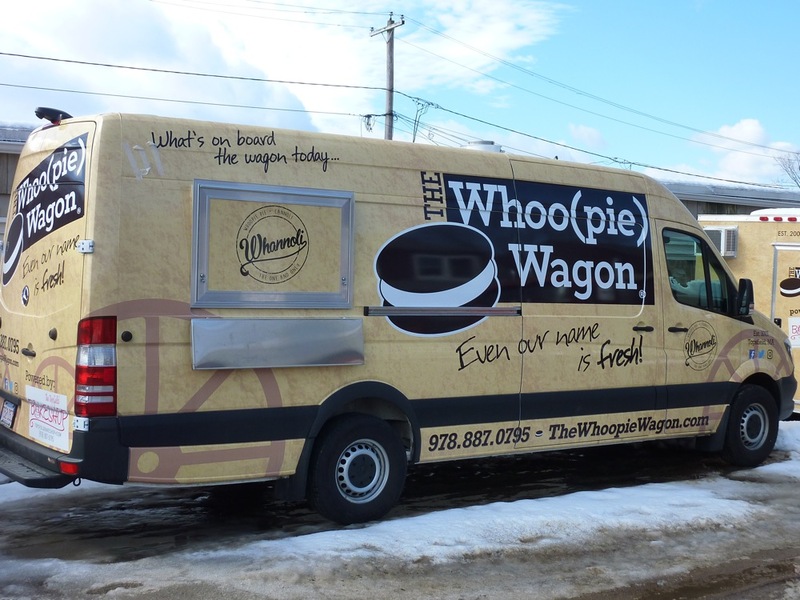 In 2018, The Whoo(pie) Wagon sold 338,500 whoopie pies! Mary and Chris Bandereck. Photo credit: The Whoo(pie Wagon. From early on, Mary and Chris had an appetite for creating tasty food. Mary, a Connecticut native and Chris, a New Jerseyite, met at Johnson & Wales University, a world-renowned culinary school in Providence, R.I. They both graduated Johnson and Wales -- Mary with a concentration in pastry and Chris, culinary. They married in 1986. For three decades, Mary and Chris worked in hotels, private clubs and food service establishments from New England to Arizona. Before The Topsfield Bake Shop and the Whoo(pie) Wagon, Chris worked a highly responsible and visible job overseeing restaurant and food services at Harvard University in Cambridge, Mass. Earning awards along the way and finding overall career successes, however, didn't equate to fully shouting "Whoopie!" about their collective professional journey. 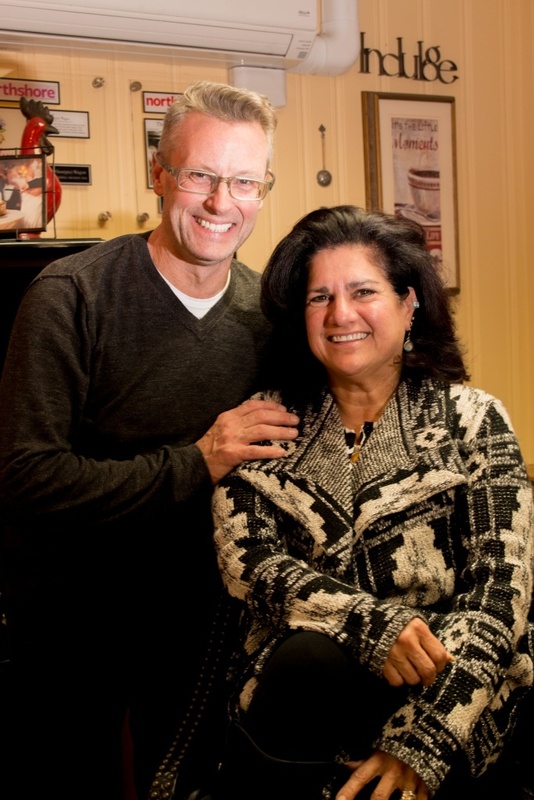 Mary and Chris moved to Topsfield in 1993 and immediately found a sense of place and community. That small town, close-knit feel first expressed itself when a neighbor baked some chocolate whoopie pies to welcome the Banderecks to Topsfield. Call it destiny: This version of the Welcome Wagon would eventually inspire Mary and Chris to start the Whoo(pie) Wagon. Mary actually started baking making cakes, cookies and pastries out of their home about 26 years ago with the community liking the baked good so much that the Banderecks bought a commercial kitchen for their home to meet customer needs. Soon, though, Mary and Chris' taste points would graduate from the cannolis, biscottis and baklava to the northeast preferences of the whoopie pie. A local country store perhaps helped change Chris and Mary's culinary destiny by asking Mary if she could create pumpkin whoopie pies. The rest is whoopie pie history. 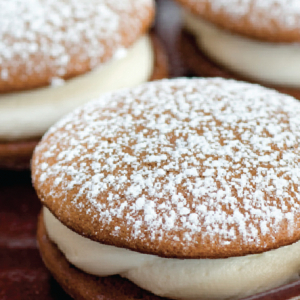 Mary started baking whoopie pies from their home and became known as "The Whoopie Pie Lady." What would happen next is the kind of fabric that shapes the American Dream. Are You Going to Topsfield Fair? Comedian and writer Larry David ordering during the filming of HBO’s Clear History at the Fair. Photo source: The Whoo(pie) Wagon web site. The Topsfield Fair has reigned, for many years, as one of the biggest and most popular local fairs in New England. It is also America's oldest agricultural fair with roots dating back to 1818. This annual fall classic destination also brings in tens and thousands a year for its midway rides and, you guessed it, food vendors with some of the most amazing comfort foods you'll ever taste. So, it's no surprise that the geographical proximity between Mary's whoopie pies and the Topsfield Fair would be a natural fit. 2007 brought that grand union with the Topsfield Fair together, as synergistic as a whoopie pie filled with cream. Mary and Chris thought they would sell about 100 of their pumpkin and chocolate whoopie pies at the Fair. The math was way off: They sold around 700 pies! "That's what launched the business," said Mary, of the Topsfield Fair. Initially, Mary and Chris thought the business would be mobile -- thus the name The Whoo(pie) Wagon. One of the three food trucks. Chris and Mary eventually bought three mobile trucks but also found locals loving the whoopie pies at their Topsfield Bakeshop. To this day, the storefront brings in steady crowds, while a commissary in back allows for space to create the whoopie pies and other baked goods in a production room. 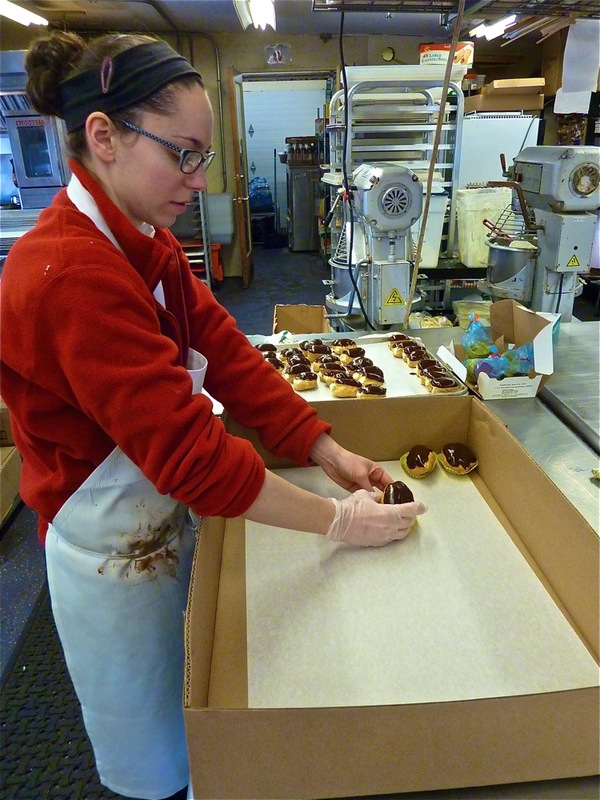 Robyn Prendergast starts to fill a box with éclairs at the production area. "Some said, don't do it -- don't open a business in Topsfield," said Mary. "It's a small town. They said to open in Boston. But we wouldn't be anywhere else. This is our hometown and we are so happy to be here. It (The Topsfield Bakeshop and The Whoo(pie) Wagon) has worked out well." The Topsfield Bakeshop in downtown Topsfield. 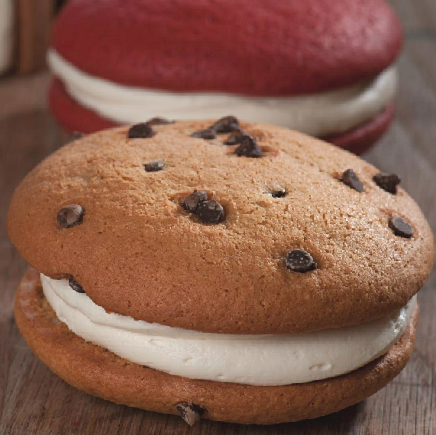 The move paid off with up to 200 customers a day and as, mentioned previously, 338,500 whoopie pies created in 2018. 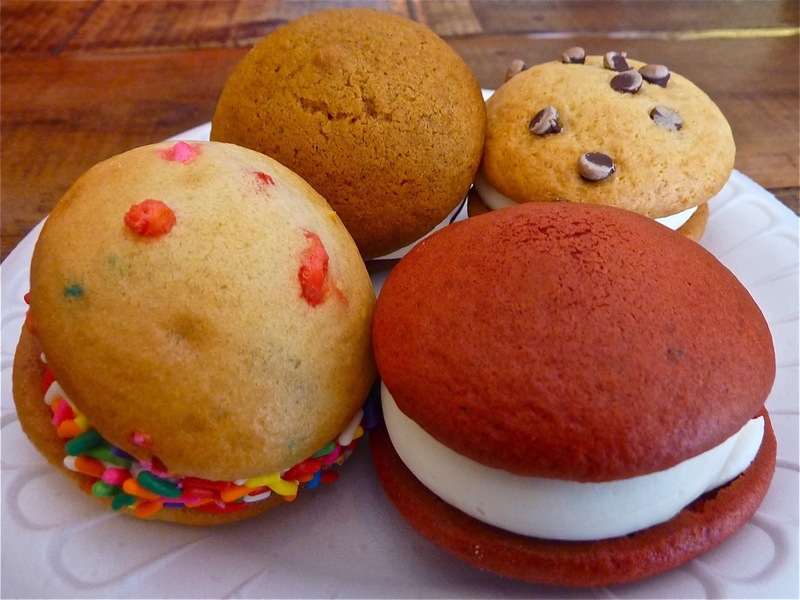 An online store allows for customers to purchase whoopie pies from anywhere in the country. 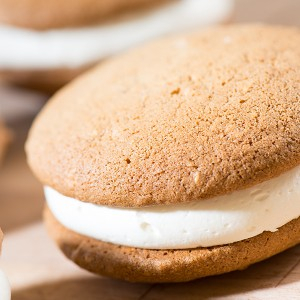 Additionally, the Food Network named The Whoo(pie) Wagon's Pumpkin Whoopie Pie as the “best fair food in Massachusetts.” Boston Eats called The Whoo(pie) Wagon one of the top 10 food trucks in Boston. The Bandereck's business even gained attention from Hollywood: The Whoo(pie) Wagon was featured in the HBO Original Film, Clear History starring Larry David, Eva Mendes and Kate Hudson. Like other mom and pop businesses that opened in small towns (Vermont Country Store, Weston, Vt.), King Arthur Flour (Norwich, Vt.), Cape Cod Potato Chips (Hyannis, Mass.) and Gifford's Ice Cream (Skowhegan, Maine), The Whoo(pie) Wagon further proved that a small business can succeed in a small town. Following that wonderful template, Mary and Chris fully invested their business with a base in Topsfield by starting The Whoo(pie) Wagon in 2008. 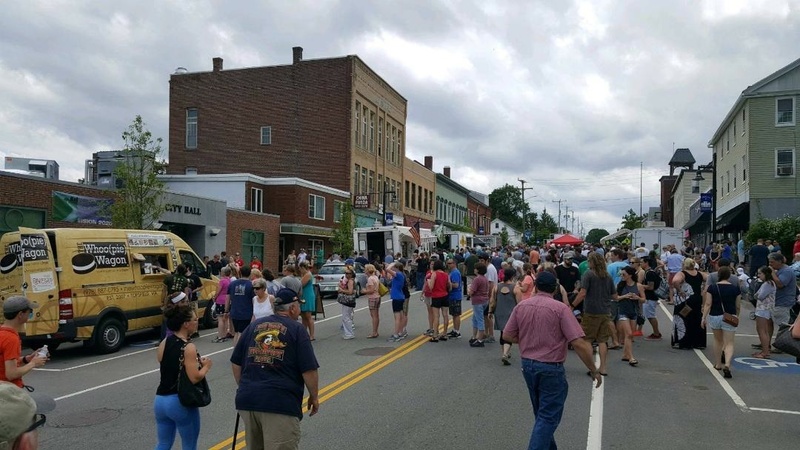 The Whoo(pie) Wagon arrives at an town event in downtown Somersworth, N.H. Photo credit: The Whoo(pie) Wagon Facebook fan page. The Whoo(pie) Wagon consistently makes its way around Massachusetts and various parts of New England for seasonal events and ceremonies, including a Lobster Bake at Harvard University (last September) for undergraduates, the New England Food Truck Festival at The Big E in West Springfield, at Mass Mutual in Springfield, the Cape Cod Food Truck Festival in Falmouth and as a pop up store across from Wegmans in Burlington. Be on the lookout, too, for The Whoo(pie) Wagon at the Rose F. Kennedy Greenway this summer in Boston. For a complete list of locations and events, log onto the Whoo(pie) Wagon Facebook page at https://www.facebook.com/pg/thewhoopiewagon/events/?ref=page_internal. 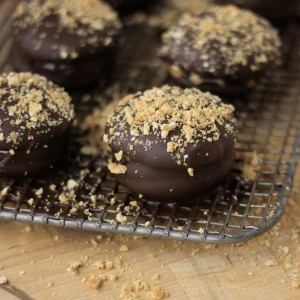 Chocolate Whoopie Pies from The Whoo(pie) Wagon. Whannoli (Chocolate Chip Whoopie Pie cake, a cannoli filling, dunked in a silky dark chocolate and then lightly dusted with cannoli shell pieces). This has to be one of the most delicious sweets on the planet. Simply amazing! Inside The Topsfield Bake Shop. Chris left his high profile job in 2011 at Harvard to work with Mary. He earned a good salary and benefited from a secure job, but, nevertheless, took that big chance despite the risk. "Yes, it was a little scary," said Chris, of leaving his job. "But it was a risk that paid off and we really haven't looked back since. Things have a way of working out." Their three adult sons, Christian, Julian and Damian, also work at the store. It's truly a family venture. Damian and Julian also attended Johnson and Wales and lend culinary expertise at the bakery, while Christian works many different tasks including marketing. "We are all comfortable working with each other," said Christian. "It's a great experience." Where the baked goods are created: the production building right behind the Topsfield Bake Shop. With the business has come one-of-a-kind scenarios that make the Banderecks stand out in town..
"The first truck we bought was in 2009," said Mary. "We traded our car in for a Whoo(pie) Wagon. It looked a bit different dropping our kids off at school." Depending on the time of the year, The Whoo(pie) Wagon has made its way around Massachusetts, including a Lobster Bake at Harvard University (last September) for undergraduates, the New England Food Truck Festival at The Big E in West Springfield, at Mass Mutual in Springfield, the Cape Cod Food Truck Festival in Falmouth and as a pop up store across from Wegmans in Burlington. Be on the lookout, too, for The Whoo(pie) Wagon presence at the Rose F. Kennedy Greenway this summer in Boston. For a complete list of locations and events, log onto the Whoo(pie) Wagon Facebook page at https://www.facebook.com/pg/thewhoopiewagon/events/?ref=page_internal. 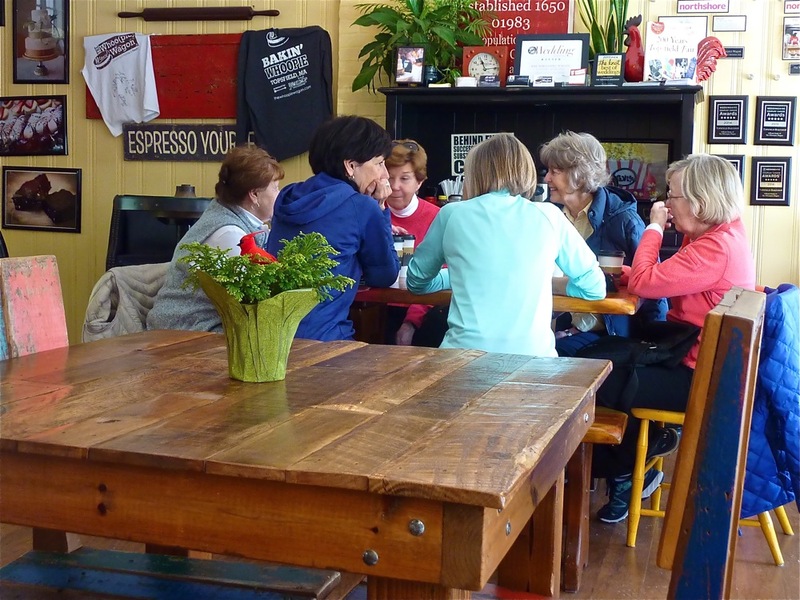 Back at The Topsfield Bakeshop, regulars shuffle in including a group of women that meet there regularly for drinks, sweets, food and conversation. Regulars gather at The Topsfield Bakeshop. The welcoming storefront provides the ideal setting for a small town bakery with a display case, an order-at-the-counter format, block wood tables, chairs with faded colors, wood floors and windows overlooking the quaint downtown. Photos of customers including residents, a Main St. sign and other Topsfield references line the wall, thus validating the close-knit ways of this beautiful small town. 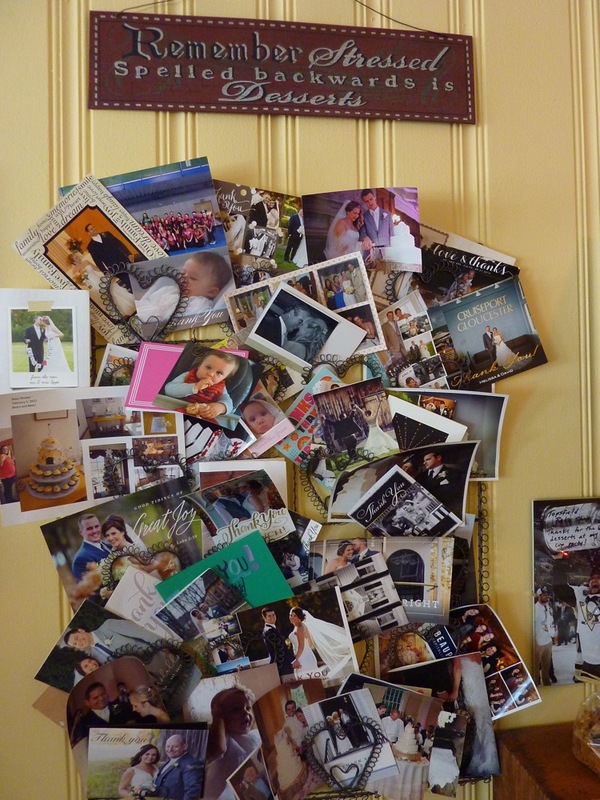 A wall of memories at The Topsfield Bakeshop. 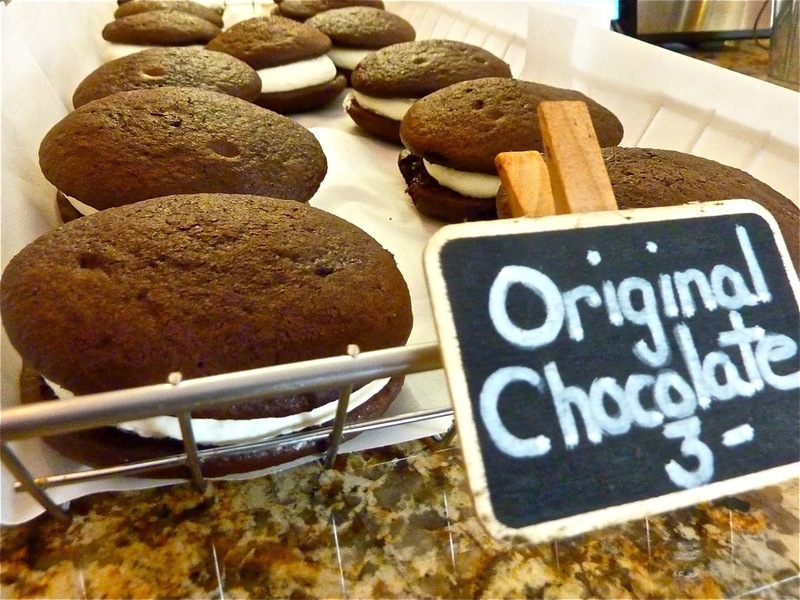 While a whoopie pie presence is clearly evident at The Topsfield Bakeshop, many other baked goods look quite tempting. The display case reveals éclairs, fresh fruit and lemon meringue tartlets, macaroons, various cookies, assorted truffles, chocolate dipped strawberries, cupcakes, mini New York Cheesecake and mini mousse cups filled with dark or white chocolate mousse. The amazing display case at The Topsfield Bakeshop. 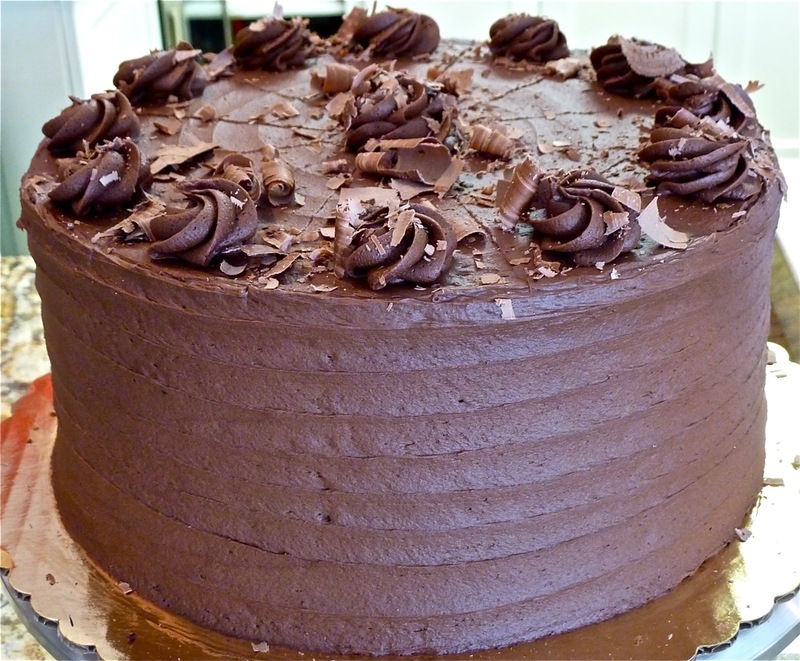 At the counter stands a tall chocolate cake that uses a recipe from Mary's mom. Chocolate cake from The Topsfield Bakeshop. Ultimately, everything here is ideal for the moment, catering, holidays, birthday parties and weddings. 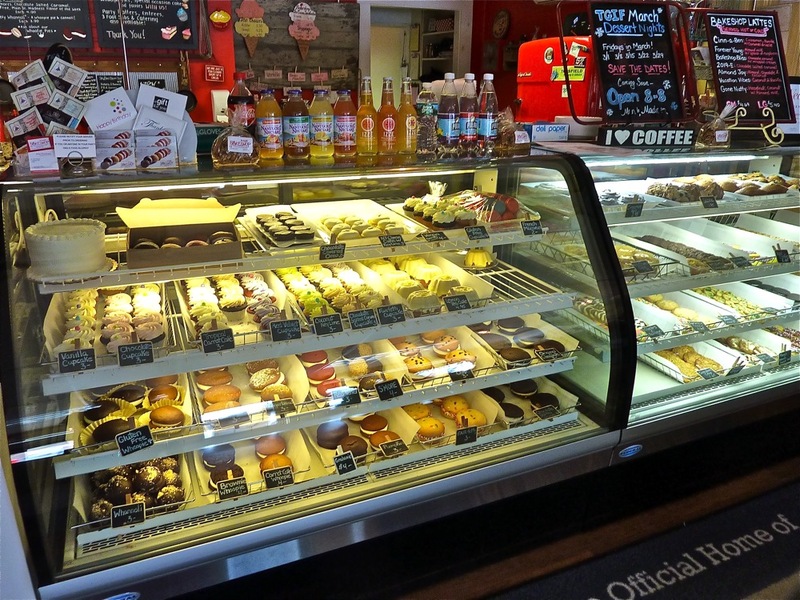 Additionally, The Topsfield Bake Shop also offers breakfast sandwiches, focaccia paninis and Richardson's Ice Cream. 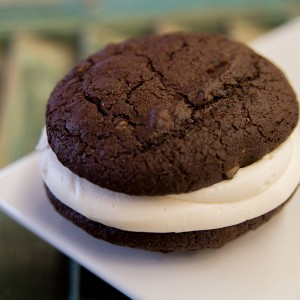 Speaking of Richardson's Ice Cream, The Whoo(pie) Wagon can fill in a whoopie pie with ice cream! Topsfield Bakeshop logo. 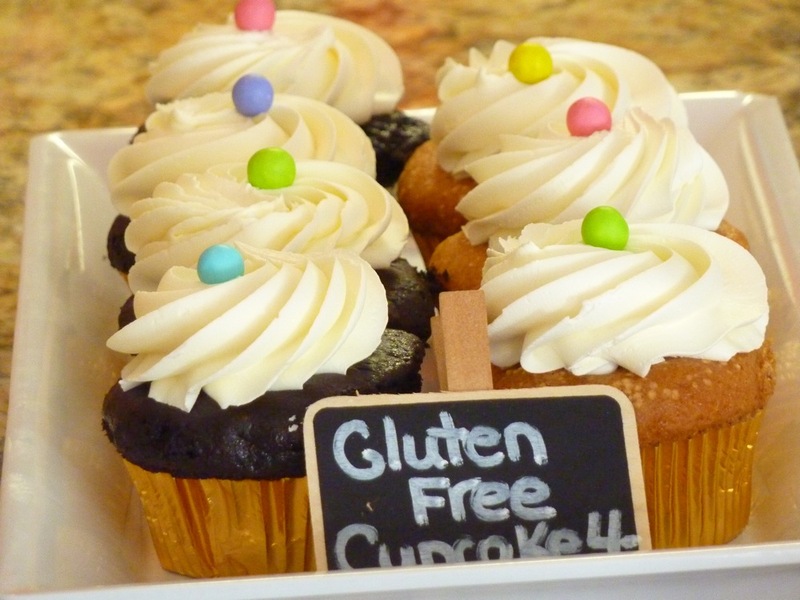 Photo credit: The Topsfield Bakeshop. 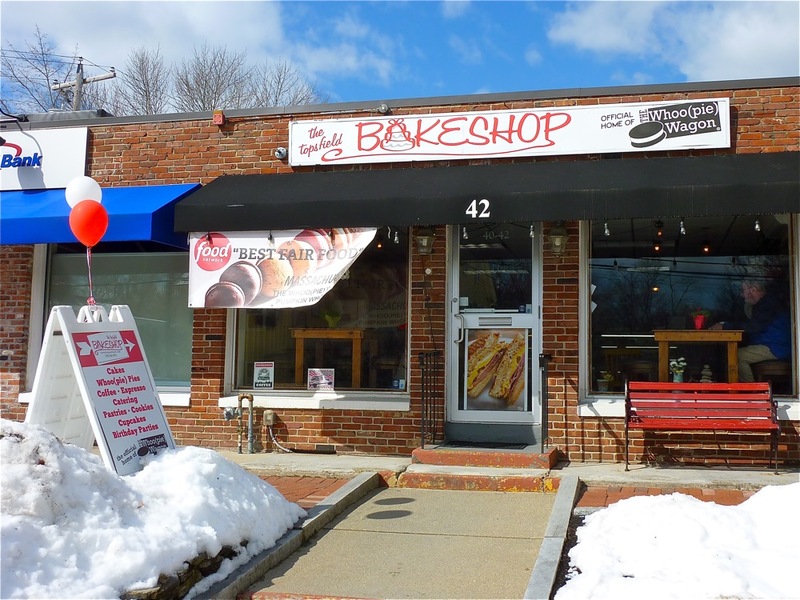 The beauty of small business like The Whoo(pie) Wagon and The Topsfield Bakeshop can often be seen in the work ethic, a pride of ownership, innovation, productivity, close family ties and the chance to genuinely connect with a community. Locals, as well as visitors from all over New England (and beyond), can see a family -- and a very nice one, at that -- create and sell the products onsite at this local treasure. That's hard to do at a chain, big box store or any business prioritizing franchising and mass production over quality and community interaction. Relationships here are built. Mary, Chris and sons not only profit from sales, but also authentic human interaction. Plus, more money goes back into the community by purchasing at a local shop like the Topsfield Bake Shop/The Whoo(pie) Wagon. 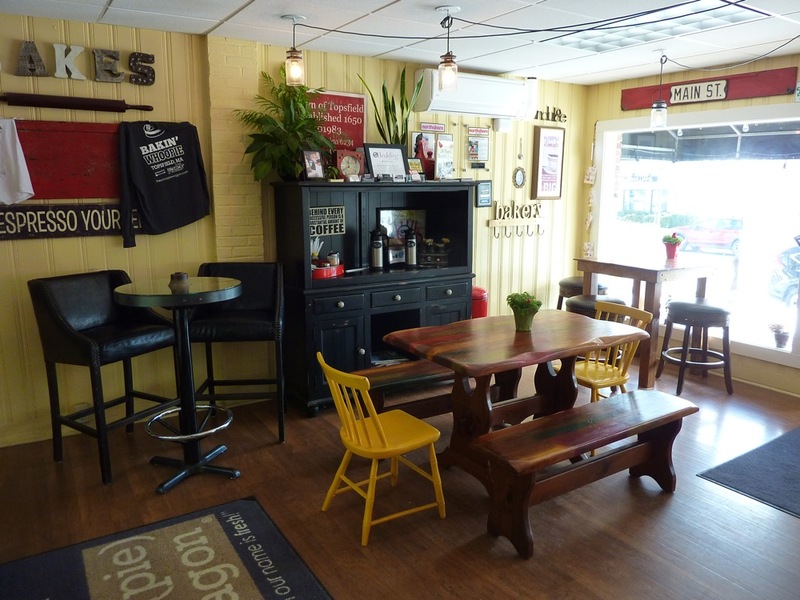 The Banderecks epitomize the American Dream, the small business model, and the good neighbor who contribute wonderfully to this idyllic small town just 45 minutes north of Boston. It doesn't hurt at all that they have chosen a product that puts a smile on one's face, and a delicious one, at that. It's enough to make you say "Whoopie!" The Topsfield Bakeshop/The Whoo(pie) Wagon is located at 42 Main St., Topsfield MA. Tel. (978) 887-0795. Enjoying the old-fashioned neighborhood vibe of Oliva's Market in Milford, Mass.